Plateau Edge, Southern Utah, 1974 by Philip Hyde. 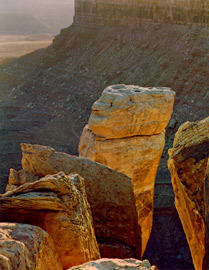 One of 12 photographs printed as dye transfer prints in the “Images of The Southwest” portfolio. “Images of the Southwest” was intended as a limited edition of 50, which in itself was a collosal undertaking. Making 50 X 12 = 600 dye transfer prints by hand was no easy task. However, at some point there was trouble with the distributor. Philip Hyde took the sale of the portfolio back over after 31 sold and no more portfolios were distributed or made thereafter. The Southwest is a very special place for me. Over the many years of travel and photography in the region, there has been a certain evolution in my work from communication of a sense of place, to a search for the essences that express the whole region’s uniqueness. My method of working has long been a kind of passing through the country, hoping to make discoveries. I want to let the country speak to me without my imposing preconceptions on it. A slow pace is important in this. And, since I can be only a temporary visitor, walking and camping for a month or a season, I must keep going back. I can’t get enough of that warm color, sense enough of the remote wilderness that still lingers in places. Here the Planet’s basic structure has been laid bare, as if to serve better the consummate artistry of erosion’s creative force, that is even now enlarging its catalog of supreme works. At the extremes of the year in Summer or Winter, the country may retreat behind a screen of seeming hostility, as with the heat haze of Summer noons, or the bone-chilling cold of blizzard winds that hurl sparse snowflakes across the unbroken spaces. But even then, the country invites you to come again, in Spring or Fall when these ephemeral seasons supply the brightest accents of nature’s scene. This elusive quality is underlined by an increasing awareness that the land’s vulnerable beauty is fading under the onslaught of development. Great piece of writing — short but profound. Thanks for posting it. Hi PJ, Thank you for the comment. It is a fine bit of writing isn’t it? The Southwest meant a lot to Dad. Besides loving the place, knowing it very well and doing everything he could to keep it from development, it was one of the top two subjects of his life’s work.